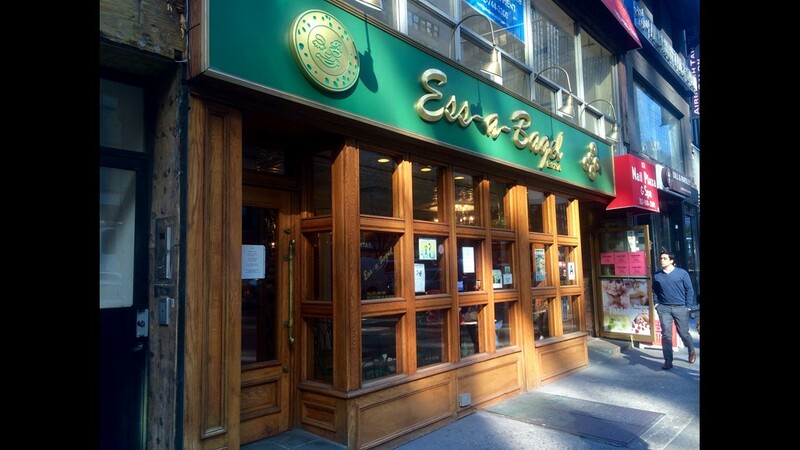 Now on 3rd Avenue just off 51st Street, Ess-a bagels are bucket list-worthy. 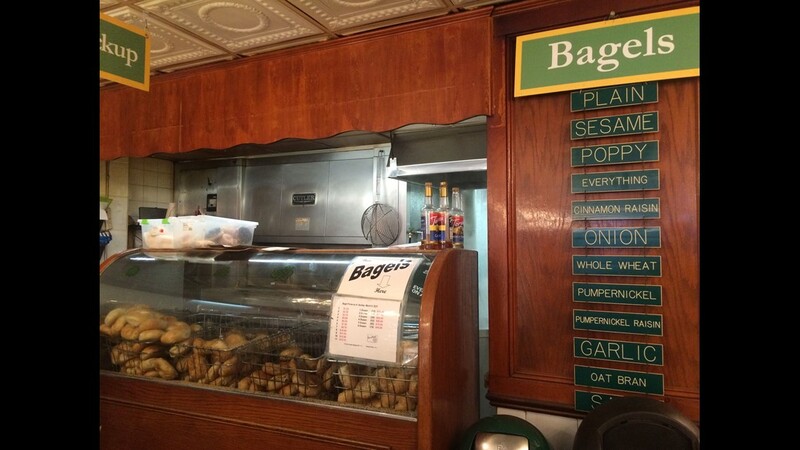 The bakery offers a dozen traditional bagel varieties. 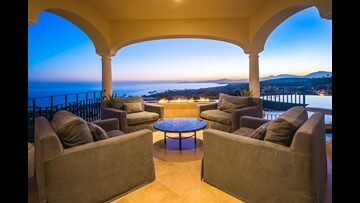 (Patrons can skip the line when just purchasing bagels). The bread is melt-in-your-mouth soft and doughy with that perfect combination of chewy inside, crisp outside. 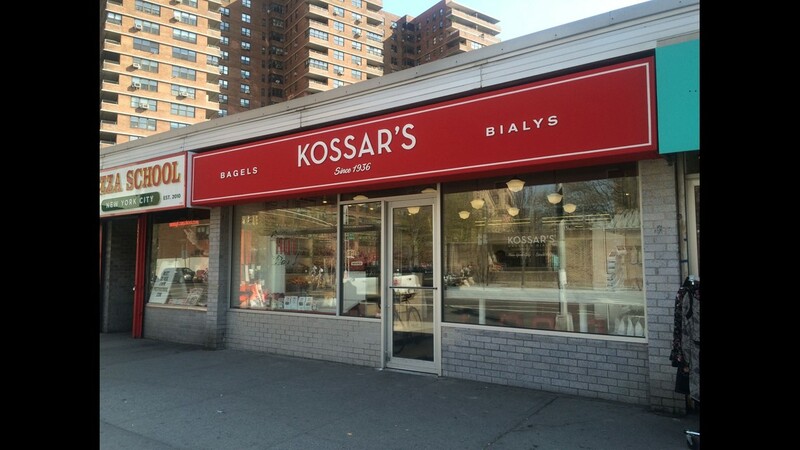 America’s oldest remaining bialy bakery, Kossar’s didn’t add bagels until the ‘90s, but the method is as historic as the shop. 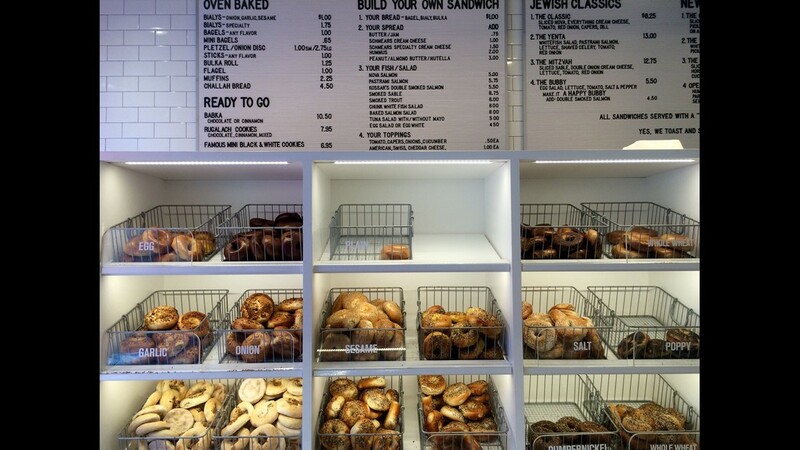 The shiny new shop now offers about 10 traditional bagel varieties made fresh daily (in addition to its iconic bialys and other Jewish goods like babka). 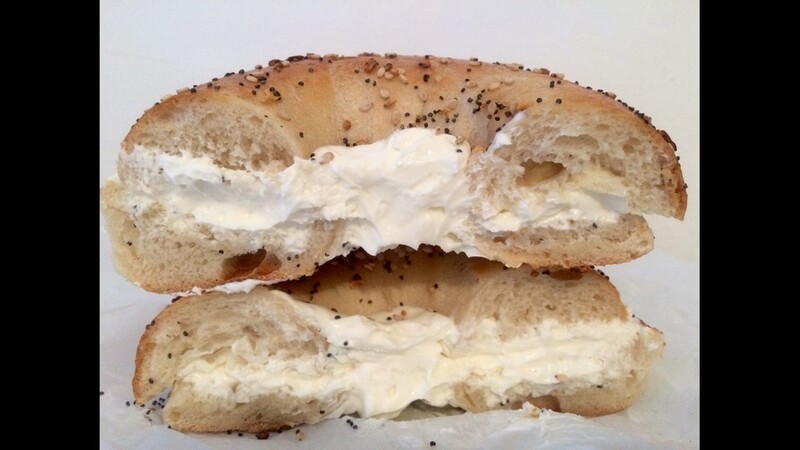 An everything bagel with cream cheese is shown. 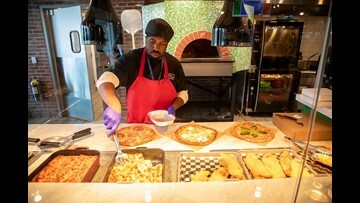 Kossar's workers tell us they don't see a most popular variety because New Yorkers all have their own favorites. 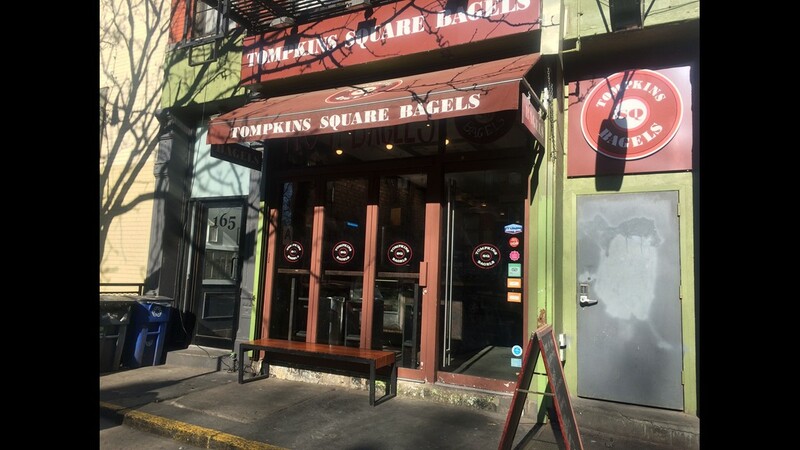 Only 4 years old, Tompkins Square Bagels represents the new with creative offerings, and almost always has guests spilling out of its East Village shop. 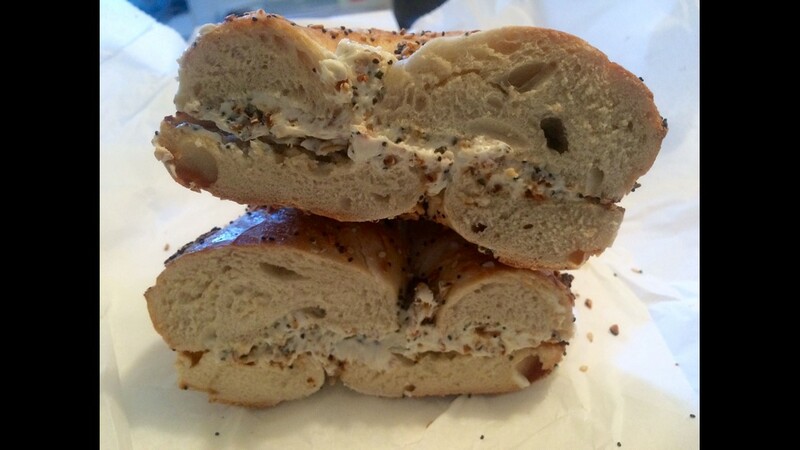 An everything bagel with everything cream cheese is stacked showing TSB bagels' density. 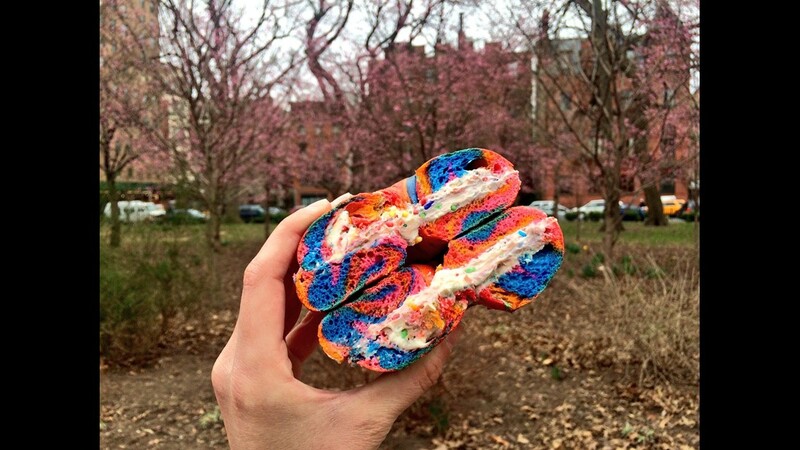 Tompkins Square Bagels released its own version of the rainbow bagel (a trend spreading around the city from its Brooklyn origin) this year, pictured here with birthday cake cream cheese in Tompkins Square Park. 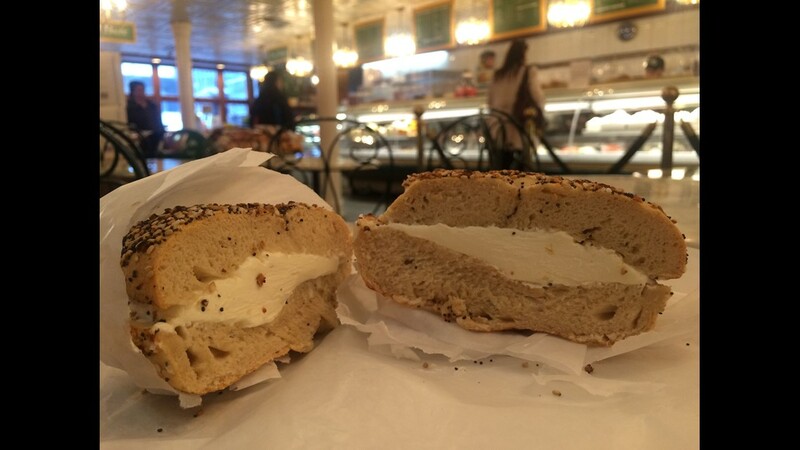 Montreal-style bagels use a thinner ring of dough and have much bigger holes than the American versions. 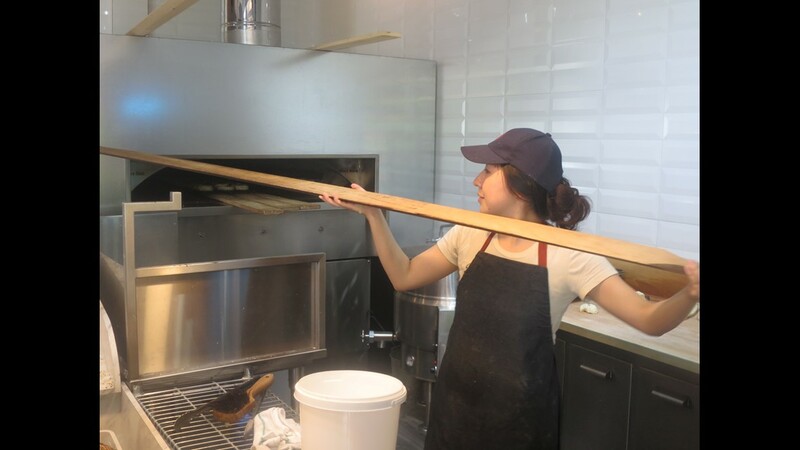 Very long thin wooden peels are used to move bagels in and out of wood burning ovens. 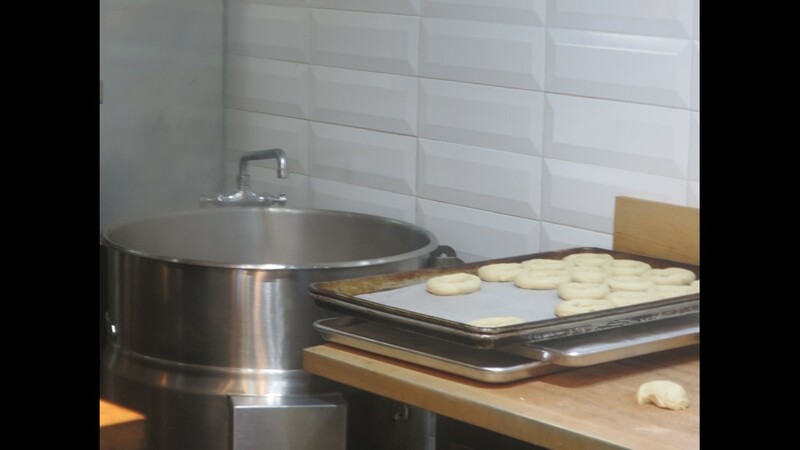 The crucial step in making real bagels is to boil them before baking in ovens. 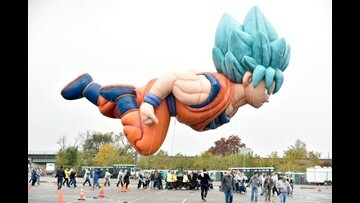 In Montreal the water is flavored with honey for sweetness. 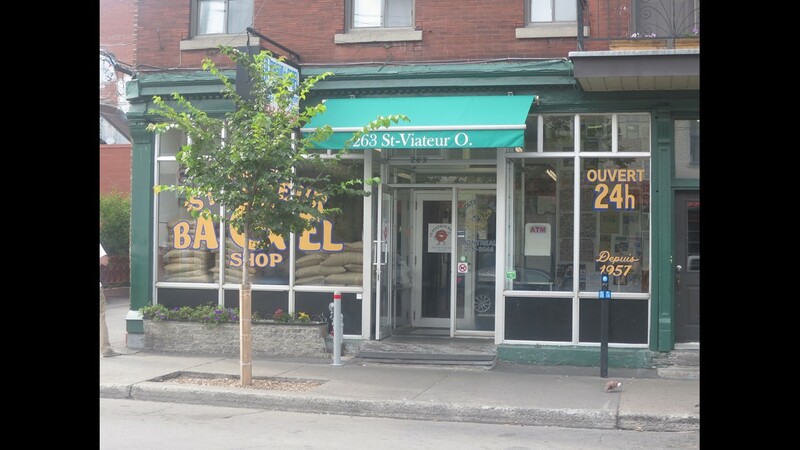 Bagels St. Viateur is the most famous bagel shop in Montreal. This is the original flagship location. 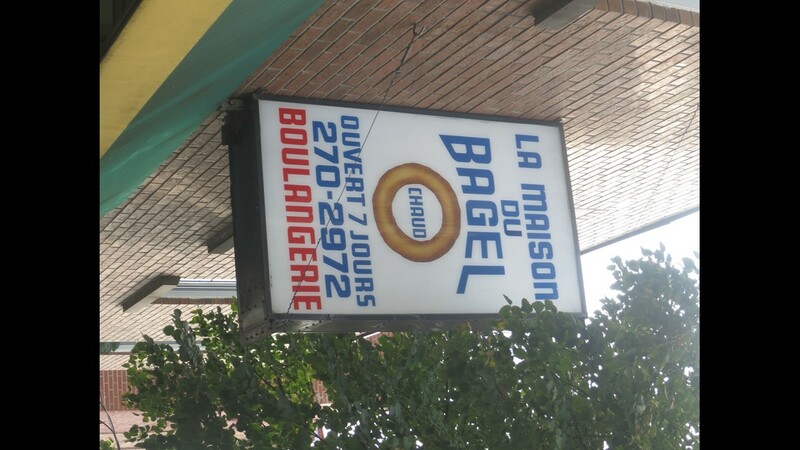 A satellite location of Bagels St. Viateur. 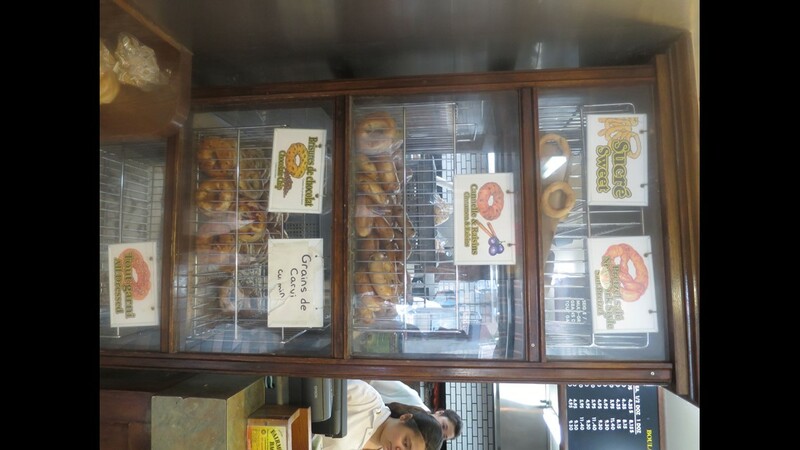 Fresh bagels for sale in Bagels St. Viateur. 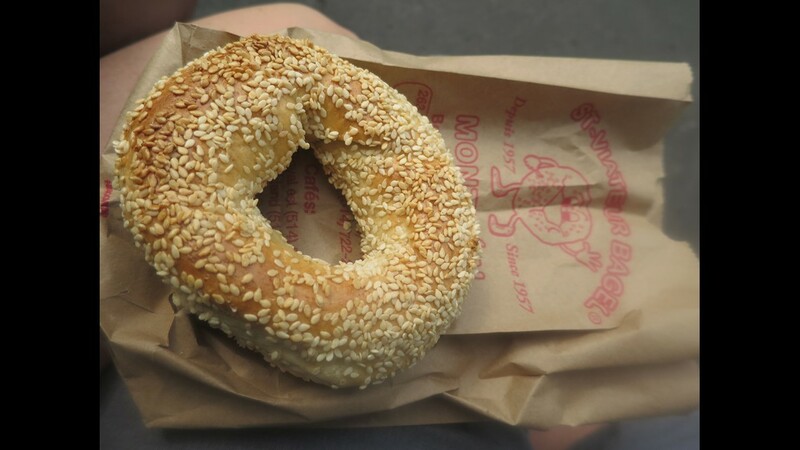 A Bagels St. Viateur sesame bagel. 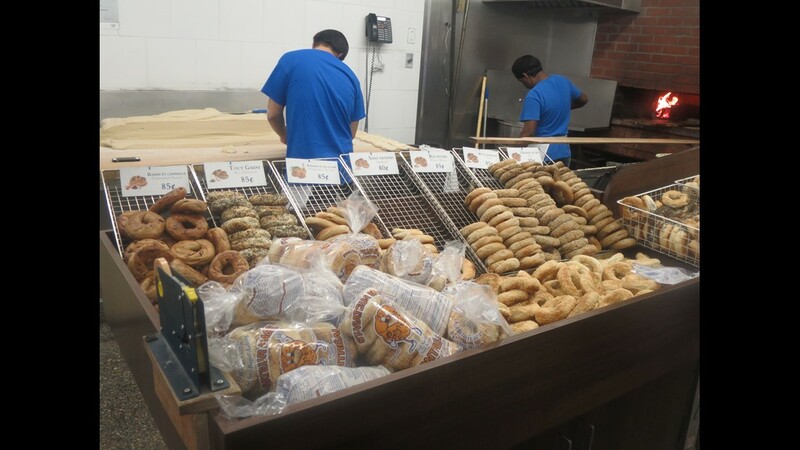 Montreal bagels are cooked in wood-fired ovens, then slide down ramps to be sold fresh and warm. 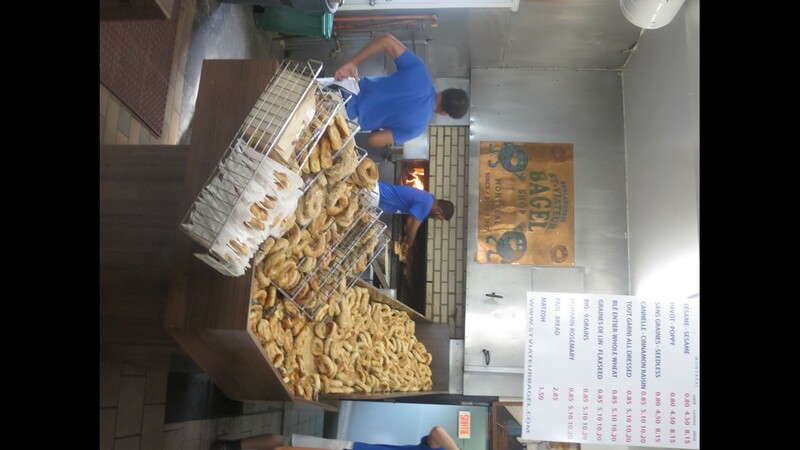 This is Bagels St. Viateur. 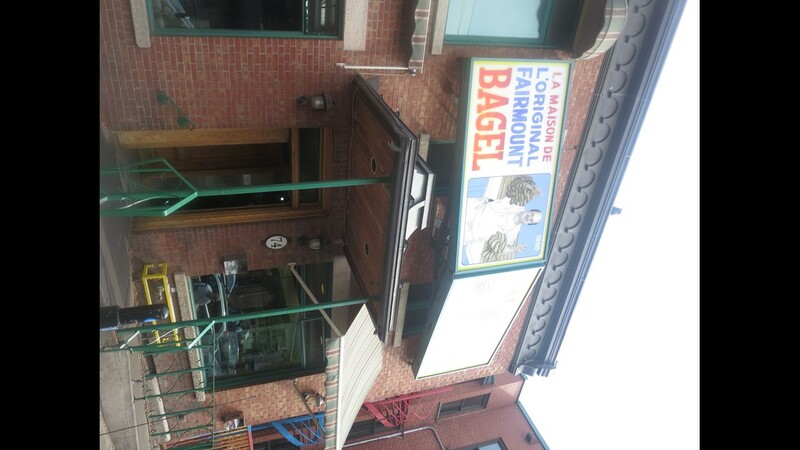 One of the two most venerable bagel shops in Montreal, Fairmont Bagels in the Mile End neighborhood. 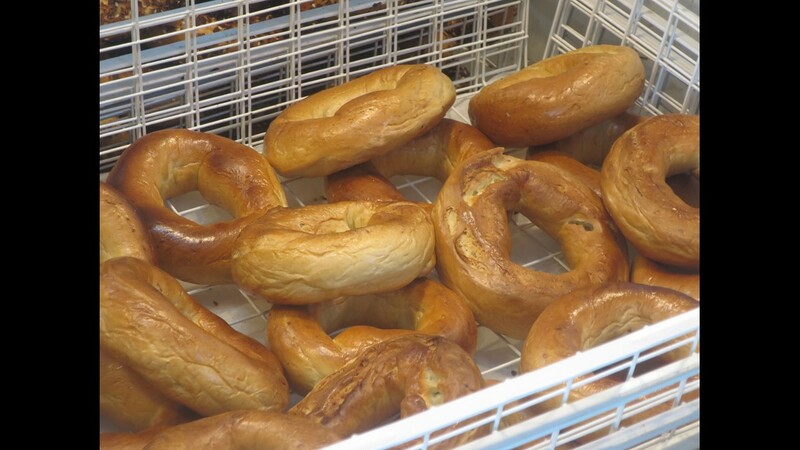 Fresh bagels for sale in Fairmont Bagels. 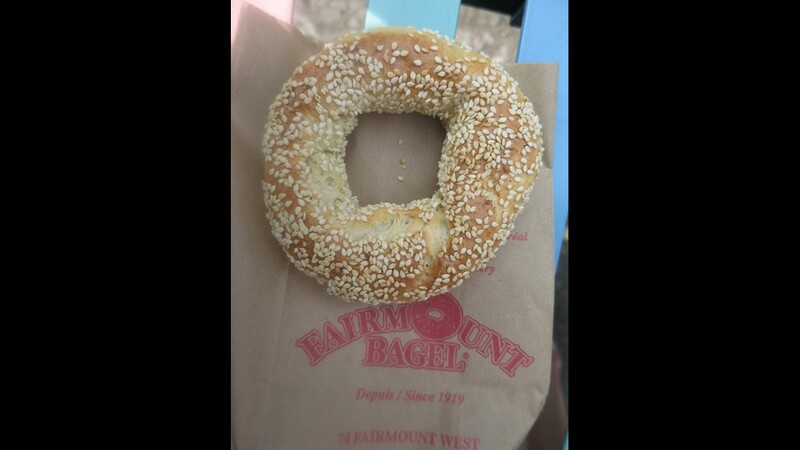 A Fairmont Bagels sesame bagel.